The groundbreaking, web-based approach to freeing your child from a feeding tube that is no longer medically necessary. What Is The Netcoaching Program? 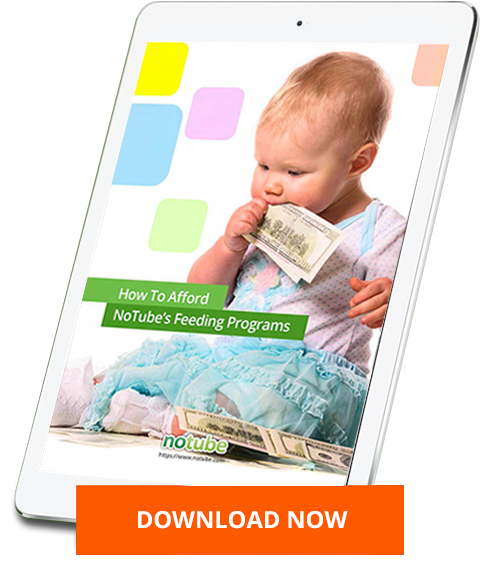 Our Netcoaching program is an online coaching experience led by the world’s leading tube weaning experts who personally help you teach your child to eat step-by-step without you leaving your home. In the last 4 years alone, more than 500 children have participated in our Netcoaching program with a 90.5% success rate. We believe that it is only when we participate hands-on in your family’s daily lives that we can achieve long-term tube weaning success. So, with the help of an online platform specifically developed for this purpose, we can make the transition from enteral to oral feeding happen together. Using this platform, you and our medical staff will communicate regarding your child’s progress in the weaning process (e.g. ask questions, upload feeding protocols and videos showcasing your child’s interaction with food). At least daily, we will respond to your questions, analyze your data and provide you with advice on how to proceed with the weaning. In short, you have the leading tube weaning experts “by your side” as you teach your child to eat without a feeding tube. Based on a detailed medical assessment questionnaire, we help you determine whether we can help your child learn to eat. If we believe we can help your child, we proceed with the Netcoaching program. By evaluating your child’s current medical needs, intake protocols, and feeding behaviors, we can then give you specific steps to teach your child to eat. You provide a daily report describing intake protocols and upload videos of your child’s interaction with food to our easy-to-use online platform. As your child progresses, you ask questions any time and our medical staff provides prompt answers and gives you clear, practical next steps to take. Our team is always just a click away. No question is too simple or too complex. By implementing our medical advice, your child reduces his dependency on the tube while learning to eat orally, and you gain confidence that your child can actually be free from the feeding tube. Your child learns to eat, tube-free, and we continue to provide support for 35 days after the last tube feeding. Get every question answered quickly, mostly in less than 12 hours. 365 days a year support from the medical experts in tube weaning. Stay at home in your familiar environment where the child feels safe. Why Is Netcoaching So Successful? Allow the child to feel hungry. Allow the child take the lead. We’ve discovered that if we provide a safe and secure environment for those two principles to be applied, it is highly likely that your child can learn to eat. In fact, the likelihood of success is 90.5%, to be exact. Our team communicates with you at least daily (more if needed) for the entire treatment, including weekends and holidays. Using our convenient online platform, you upload videos of your child eating, you upload feeding protocols, and you can ask all of the questions that are on your mind. We provide immediate advice for you to apply to the next feeding situation. It’s like having your doctor in your home 24/7. When you enroll in a Netcoaching program, we will work with you for as long as it takes for your child to learn to eat well enough to sustain a stable weight for 35 days without needing a feeding tube. It’s that simple. We are committed to teaching your child to eat. If your child gets sick or something else unexpected happens, don’t worry. We’ll stick with you for as long as necessary to help you free your child from the feeding tube. From pediatrics to neonatology, from psychology to psychotherapy and physiotherapy, we’ve got all areas covered internally to ensure tube weaning success for your child. With our team’s experience in the tube weaning field, there are no questions or situations that too difficult to handle, even if your child’s situation is extremely complex or unusual. Our lead doctors have worked in this field for more than 30 years. They’ve seen everything. An assessment is required to begin the Netcoaching program. The assessment is based upon a detailed medical questionnaire that you complete. Two of our doctors will review your information and provide you with a detailed medical evaluation of the status of your child, and whether your child is a good candidate for learning to eat without the feeding tube. The cost of the assessment is a one time fee of EUR 120.-. Once you’ve completed the assessment, you are under no obligation for any further commitments, unless you choose to proceed with Netcoaching. You are in control. You only pay if we think we have a 90% chance of succeeding (passed assessment) and there’s no obligation to commit to anything past the 120 Euros. The Netcoaching fee lasts for as long as it takes until your child is tube free, i.e. only 35 days after the last tube feed, even if it takes several months (maximal 6 months from start). If, during the first seven days of working with our team, you do not want to continue with Netcoaching, we’re glad to refund the entire Netcoaching fee, so you have nothing to lose. Please read our general terms and conditions for more details. How safe is tube weaning? How do you work with my local medical professionals? Will Netcoaching work for my child? What happens if you are unable to teach my child to eat? What if I want to have support for longer than 35 days after my child learns to eat? How long does Netcoaching last? How complicated is it to upload video to the Netcoaching platform? Does my insurance cover the Netcoaching program? What advantages does Netcoaching offer compared to hospitals in my country? How do I get support again when something changes in the behavior of my child? As intensively as parents or the local medical team wishes. If necessary, any professional can be integrated on a daily basis into the communication of our ticket system by opening the child’s password to any professional the parents wish to be included allowing them to ask questions, comment or make suggestions. This will cost the doctor or therapist 2-3 minutes/statement. What is important for the Notube Team is that there is no verdict against tube weaning from any medical perspective and – in case of any strong skepticism or reservation – these issues must be clarified after the assessment phase and before starting the weaning. We do not wish to increase the psychological burden of parents during their empowerment process of the weaning additionally and avoidably by issues of loyalty and the unlimited diversity of possibly conflicting medical opinions. The Notube Team will always be willing and prepared to interact with any kind of comments and concerns stated by the local medical teams who have been involved intensively in the child’s prior treatments. This is a very frequent and very important question and the topic is addressed specifically during the pre-assessment and assessment phase and if necessary throughout the whole weaning process. Ups and downs in the parents perception of their child’s emerging skills and the observation of possible obstacles are normal and need to be discussed on a regular basis with respect, care and diligence. The chance of your child not being able to learn to eat, after assessment and the suitability-check have been performed with positive results, is minimal. In most cases weaning can and will happen in a matter of 2-4 weeks but some children just need more time due to the complexity of their perception of the feeding situation, preexisting refusal and avoidance patterns, autistic like mental processing or any other confounding factors. If the severity of a child’s disability does not allow a full transition from enteral to oral feeding due to the amount of time and effort needed, partial weaning might be the final solution which allows the child to eat and drink as much as it can during the day but keeps some tube feeds given during the night. We believe that 35 days is sufficient to become used to a life without a feeding tube. However, we fully understand that some parents need further support in helping their child develop age-appropriate eating behaviors. Every former Netcoaching participant may therefore participate in our Learn To Eat program without the need for another assessment (given it’s been less than six months between the two programs). In the Learn To Eat program, we focus on helping children diversify their foods and reach age appropriate levels. We will coach you until we can achieve a full tube weaning success, i.e. your child’s weight has stabilized and no enteral nutrition has been needed for 35 days. With some children, this may take longer than with others, so several percent of all participants remain in our program for longer than 3 months. If at some point due to the complexity of the underlying diagnosis we agree that a full wean is not possible, we will work with you to achieve the maximum quality of life for your family despite your child possibly still needing night feeds. On our platform, you can upload videos right with your Smartphone, much like you would upload a video to Facebook or other social media sites. Either take one first and then log onto NoTube on your mobile and upload it or do it the other way around. Both works! If you want to upload a video from your camera or laptop, you will see an upload video button in your personal NoTube portal. Within the first week of the treatment you will work very intensively with us to help your child reach their full potential. If you are not satisfied with our services during that time or do not feel that we can help your child, you can cancel your NoTube treatment anytime by sending us an e-mail to help@notube.com. We will immediately refund you the entire treatment fee. To find out whether your insurance covers the Netcoaching program send us an e-mail to help@notube.com and we will check in our files. Should your insurance not be one that has previously covered the Netcoaching program, we will gladly support you in any way if you wish to apply for coverage at your insurance. Your child will always be assessed by our most senior doctors, Marguerite Dunitz-Scheer, MD and Peter Scheer, MD. Together they have over 50 years in professional tube weaning experience at the University Hospital in Austria and have weaned more than 3’000 children together. The treatment will then be conducted by one of them and a member of our psychological team, headed by Sabine Marinschek, PhD and Karoline Pahsini, PhD. As explained above, should we need further know how, we will pull it in at no additional cost. By signing up for Netcoaching you save your child from the immense risk of hospital caused infections as well as eliminate any travel costs. Our team consists of the world’s most experienced medical doctors in tube weaning. As a result, our rate of successful tube weanings is 90.5% – in most hospitals the success rate is below 50%. Netcoaching will end 35 days after the very last tube feed has been given and when the weight course has been stable. The maximum duration of the support by Netcoaching is one year after commencement of the weaning program, whereby this can be expanded in case of certain developmentally or medically caused reasons by purchase of a monthly Learn to Eat ticket for EUR 350.- for as long as the family wishes for. During the Netcoaching and for one more month, your account remains open and you can receive support from us 24/7. After a successful Netcoaching, you can join our Learn to Eat program, in which we will work with you to further diversify your child’s range of foods. Should there be any behavioral or medical problems during that time, we will also address them together with you and your local pediatrician. Wonder if Netcoaching is right for your child? This free guide will help you find a way to afford the program of your choice to help your child. How do payments by installment work? Which are the Health Insurance Cost Coverage Options? How to set up fundraising program?